Asian greens are a go-to staple at the farm for summer salad mixes, when the cool-loving lettuces are sulking in the heat. Their crisp and complex flavors, colors, and textures add diversity to your beds and will keep you in delicious greens through the hottest part of the season. Bunching but not quite heading types include bok choy (also called pac choi, Brassica rapa var. chinensis) and komatsuna (B. rapa var. perviridis). Somewhat looser and leafier are tatsoi (aka spinach or spoon mustard, B. rapa var. narinosa), which produces rosettes of spinachlike rounded leaves on short, crisp stems, and mizuna (B. rapa var. japonica), which produces loose clusters of tender, deeply frilled leaves. These four variations of the same species as turnips and broccoli rabe have mild, mustardy flavors with a hint of deep mineral earthiness and are at home in salads, braised, or added to flavorful dishes. Fertile, moist, but well-drained soil serves these greens well, in sunny locations or lightly shaded during the heat of summer. 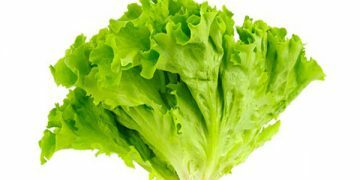 Although they’re happy in cool weather like other leafy greens, these crops fare far better through the swelter of summer, when lettuce and spinach typically send up their pale flowerstalks as though waving the white flag. Plant from early spring through midsummer, sowing about 1 seed per inch in well-prepared, compost-amended soil and covering with ¼ inch of fine soil. Thin tatsoi and komatsuna to 4 to 6 inches apart; thin bok choy to 8- to 10-inch spacing. Sow in late summer for a cool-weather fall crop. For baby Asian greens, you can blend your own mix and broadcast it across an entire well-prepared bed, raking it in lightly and watering thoroughly. These can be cut young and repeat harvested for salads or braising. Try alternating rows of red and green komatsuna or frilled and lobed bok choy for a decorative effect. Maintain even soil moisture to keep these mildly spicy greens from developing fiery flavors. Water with liquid seaweed or fish emulsion every couple weeks to keep them growing rapidly. 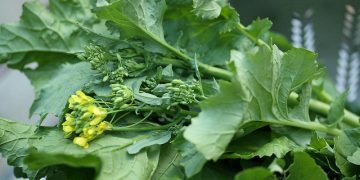 Bolting signals the end of the line for the leafy yield of these greens, but their flowerstalks and buds may be eaten like broccoli and the bright yellow blossoms tossed into salads and stir-fries. Gather small leaves for salads when they reach about 3 inches high. Thin these crops by harvesting, removing small leaves and entire plants for fresh use from between others that will grow to full size. For a broadcast planting, shear what’s needed, starting from one end of the bed, then return to it a few weeks later when it’s regrown. In general, these crops suffer less from pests such as the loopers and cabbageworms that put the bite on brassicas, but they are not entirely immune. Put row covers in place over young plants and seal the edges to protect them from egg-laying moths, adult root maggot flies, and flea beetles. Pinholes in the leaves mean flea beetles are already active. Be on the lookout for slugs and use traps to catch them before they rasp holes in the greens.